Leave Marshall street and cross into the North End along Hanover street. Take right at Prince street, and then turn right along North Street. Number 19 North Square was the home of the famous goldsmith and patriot Paul Revere. The house bearing his name was his home from 1770 to 1800, nearly a century after its construction in 1680. It is the oldest house in Boston, and a very old house by American standards. He and his family may have lived in it as little as a decade, from 1790 until he sold it in 1800. The Paul Revere house is beautiful, marked by its old age, but beautifully restored. 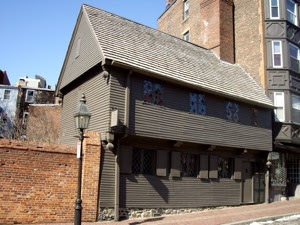 It has been a museum since 1908, showing interiors that may show how this period property may have looked, when Paul Revere lived here, and beyond. To me the Paul Revere house is the most beautiful stop of the Freedom Trail. The neigbouring building, the Pierce-Hichborne building, was built as early as 1711, and is a beautiful example of colonial Georgian architecture. It is also a museum run by the Paul Revere Memorial Association.